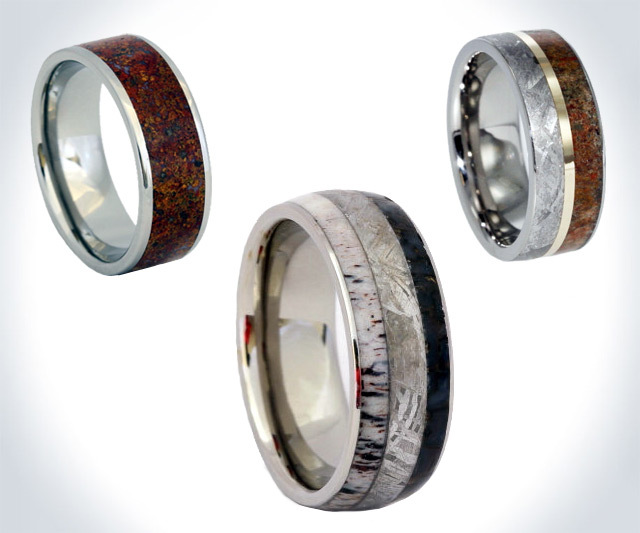 If your special someone is really that special, you won't just give them a ring, you'll give them a ring from a bazillion years ago! A ring that symbolizes how grand, vast, and enduring your love is. A ring that proves the two of you won't simply last forever, but have been fated to fade into one another's arms since that ginormous F'ing meteorite dealt death and destruction across our lands, decimating the entire dinosaur race, and leaving behind millions of lifeless piles of flesh to rot, fossilize, and sink deep into the earth! Johan Rust makes just this intensity of ring. In fact, he has about two dozen of them in his meteorite & dinosaur bone collection. 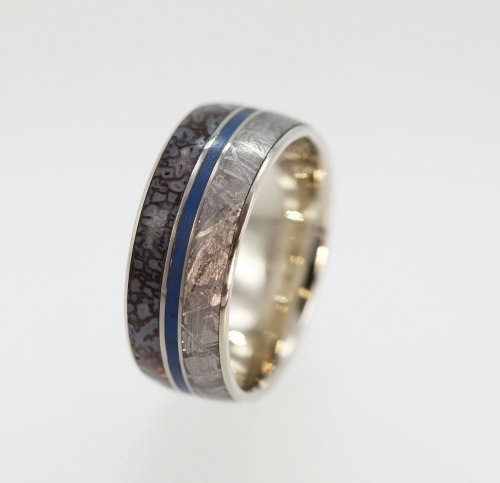 Inlays of Gibeon meteorite and agatized dinosaur leg bone from the Morrison Formation in Utah decorate these standout titanium and 14K gold bands. The rings' Gibeon meteorite material entered earth's atmosphere about 30,000 years ago* (at a rate of 17 miles per second! ), exploded in the air, and showered its fragments over a large span of Africa. Prior to that, it spent 4 billion years cruising through outer space and chillin' with Dr. Who. Today, over 54 tons of Gibeon is on display in museums and university collections. Its largest recovered mass weighs 1,450 pounds, and is located at the South African Museum in Cape Town. 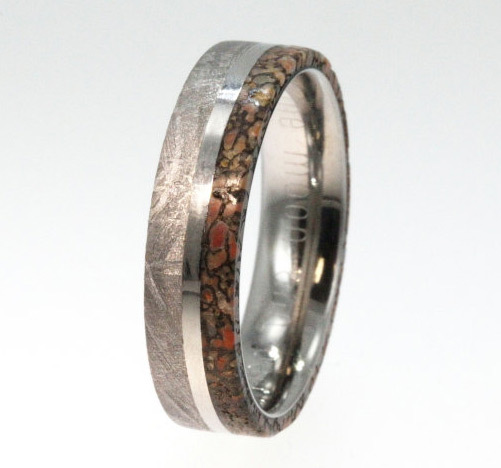 In Rust's rings the Gibeon meteorite appears in various colors and markings, its main composition being iron (90%), nickel (8%), and cobalt (0.4%). Other trace minerals making cameos include kamacite, taenite, troilite, chromite, deabreelite, enstatite, and tridymite. Inlaid dinosaur bones also have varying colors--and precise ring hues cannot be guaranteed in this regard since acquisition is rare and inconsistent. The agatizing of the fossilized bones is due to their cellular structure's replacement by quartz. This leaves the bone structure intact, but, along with impurities that were in the surrounding sediment, affects coloring, which ranges from brown to black, with splotches of red, blue, and yellow. The Morrison Formation the dinosaur bone hails from covers 600,000 square miles over several states. The fossils date back to the Jurassic period, meaning they are a minimum of 65 millions years old. 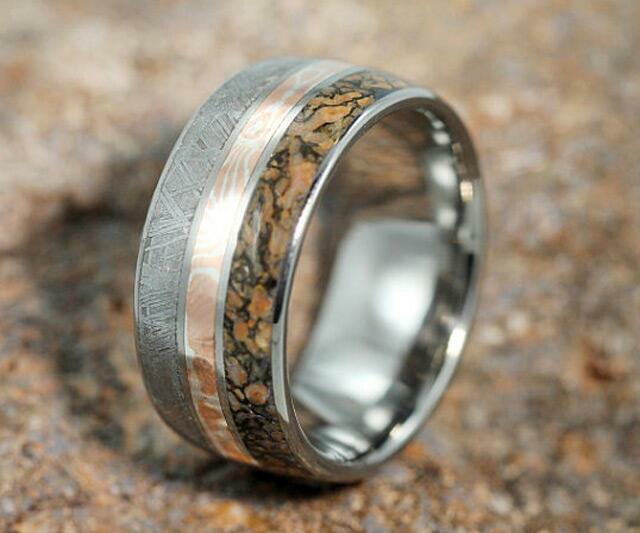 All meteorite & dinosaur bone ring inlays are entirely seamless. Like all of my transitions in life. *So, no, not really the same one that potentially wiped out the dinosaurs.